Grass cutting weekly or fortnightly. Holiday grass cutting. We can take the clippings away. We can even clear and remove fallen leaves in the autumn. Some times it can be more cost affective to start over, with small lawns. Watering just once a week can be enough to stop the lawn browning. 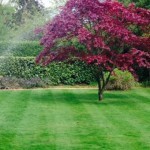 This year was a particularly dry and hot year in the UK which made it a tough year for our lawns and gardens. Many lawns in the UK are looking very patchy as a result where grass has died or gone into ‘survival mode’ and not recovered. Every summer lawns need watering regularly, this year, to keep a green and lush lawn watering was essential at least twice per week. However if your lawn has suffered, all is not lost, we can help! Where the lawn is still brown and patchy there is dead matter which will need to be removed in the spring, the grass plants might still be alive underneath the soil but the dead matter on top of the surface is unlikely to recover. A scarification will remove most of that dead matter and any weeds, moss or thatch in the lawn, this will allow existing grass plants more space and water to grow. 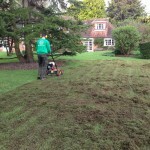 Following the scarification we will aerate the lawn, top dress and overseed. The aeration process will allow better drainage, getting moisture to the roots of the grass plants. New seed is planted to fill any gaps and patches, introducing new grass plants to the lawn. Watering the lawns in times of drought. is currently a necessity as we havent had much if any rain now for some 8 weeks. If you havent already, its time to get the sprinklers out. You can water the flower beds and the lawns all at the same time. The trick to watering lawns to help them stove off a drought situation (where the grass browns off) is to water once per week, but to water until the lawn is flooded. Ideally you will need to keep the tap on, until you have standing water on the surface of the lawn. This will allow the water to seep down to the root system, and not just the top few millimeters or perhaps the top centimetre. For the grass to benefit from your watering, the moisture must get down to the roots. You can easily check with a garden spade, by opening up a slit in the lawn to see how far the water has managed to get. If the water hasn’t managed to penetrate the soil down to the roots, then you will need to leave the sprinkler on for longer. By watering just once a week through the dry period, you will most likely keep the grass green and save it from a huge amount of stress. Once the lawns are stressed it is harder to help them to revive them selves. Often people that the lawn is dead when it turns brown, but in reality all that is happening is that the grass plants are going into a survival mode. Where they sacrifice the leaves and stems that are above the soil, to save the root system beneath. The roots will slow down productivity and wait for the rains to come, before they will send new shoots and in turn leaves. This will create dead matter, or thatch that will need to be removed the following spring, or worse, it will create space where weed seeds and moss spores can blow in. Thus reversing all the hard work that is done by our team throughout the spring and previous autumn. Remember that the lawn is living and it will suffer in times of drought. If the plants need water then the lawn needs it too. By now most of our customers will have had the moss treatment sprayed on the lawns. We are sorry if we missed a few bits here and there, but we are going round making sure we spray any bits we missed. It is nearly time to scarify…. 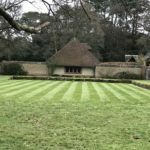 The act of scarifying will remove as much of the dead moss and thatch from the lawns as we can, but it will also open the very top layer of soil. This is important as it will break up any surface roots, promoting strong healthy growth of the grass that is already on the lawn. It will also make a tilth for the new seed that we will introduce to sit in. Good soil to seed contact is vital and as the weather reaches a good germination temperature, we want to get the new seed to germinate quickly and for the existing grass to recover before the mowing season really kicks in. Summer will be upon us soon and we want the lawns to have as much recovery time as we can. It certainly feels like spring is on its way. We are out spraying moss and getting the first cut to the lawns done. Looking forward to 2017, with some new team members that are excited to have joined the TLC crew. With more hands on deck, we will be able to deliver our service more smoothly going forward through the year. Our grass cutting team still has some spaces for large lawns, from half an acre upwards, so get in touch if you need help with that. The weather has finally turned hot… People often water their plants, flower beds and pots. But often forget about the lawns…. Watering heavily just once a week can be enough to stop the lawns browning off. A handy tip, is to water the lawn until there is surface water. (at least 1cm, but more if you can afford it) This way, once you have turned the hose off, the water can continue seeping down towards the roots. Water in the evening (this can encourage slugs and snails out) but is better for the lawns, as it will allow the water to get down deeper before the sun dries things out. Remember, grass is a living thing, and needs water too. As we march through summer, (well, the 3 days we had back in July) the rain keeps coming and the grass keeps growing. Me and the team have been out grass cutting every month this year, and with all this rain it has some times been a challenge. In the hot weather we advise that you lift the mower by at least 1 notch, so as to stress the lawn as little as possible. Perhaps even cut with the box off if you are cutting frequently enough. To aid in the nutrient delivery for the lawns. We have finally taken delivery of our new Mower, for cutting paddocks and fields, not to mention, large lawns and even football and cricket pitches, so if you need our help with mowing in the Cranleigh, Surrey hills areas and Guildford, get in touch. With some luck, the warm weather will come back for a few more weeks (months…. ), before we start the decent into autumn. For now lets enjoy this typical British summer. The warm wet weather is ideal for grass to grow, and I am sure that you have all been out in your gardens mowing the lawns in between rain showers. The only trouble with all this, is the weeds grow fast too. We have been some what hampered so far this year with getting out with the weed kill treatment. We are aiming to rectify that this week, with the hope of some dry patches in-between forecasted rain. If you haven’t seen us yet, you will be getting a visit very soon. For any weed control information, please get in touch by sending us an email to helptlc@hotmail.co.uk Many thanks, Dean Babister. By now, most of the leaves will have fallen from the trees in your garden. The rain has arrived and the gardens will be looking a bit sorry for them selves. This doesn’t mean that the work on the lawns is over for lawn just yet. It is really important to make sure that all the leaves are picked up from the lawns, This is due to the fact that the leaves will create a layer over the top of the grass. This area is the perfect area for bacteria and mould to flourish. This can be harmful to the lawns and it will be far easier to pick up the leaves now, than to fix the lawn in the spring. Also, if the lawn has not yet received an autumn feed, or aeration, then its a perfect time to do it, as the ground will be soft, and the final grass cut of the year will be upon us soon. The beginning of the end of the summer is upon us, but the rain of the past 10 days has begun to bring the dry lawns back to life. Its ben a long hot dry summer for the lawns in Surrey, and for those of you that either couldn’t or wouldn’t water the lawns, the rain of late will have come as a blessing. Coinciding with our late summer feed (step 4 in our 5 step perfect lawn plan) the lawns have bounced back with vigour. Out cutting grass in the heat this afternoon, I was delighted to be filling the grass bag once more with lush green grass clippings, rather than the brown grass and dust that we have had to get used to over the past 6 weeks. Time to start reducing the mower hight down a notch, as the grass will be able to endure more stress now that it can replace its energy much quicker and easier. This said, some lawns are still very dry, and the inevitable thatch has set it. This will mean a busy spring for us, scarifying it all out. But the results are always worth the hard work. I am happy to announce that we have bought a 1.5 ton mini digger so that we can more easily level lawns and also offer clearing to gardens of all sizes (where access allows) so keep your eyes out for the bright green digger in a garden near you. Not to mention the addition of a brand new Pressure surface cleaner, so now we can clean your patios and drive ways in and around surrey, all as part of your annual care package. We all hope you are still enjoying the garden as much as we are, and lets hope that summer holds on as long as possible.